This is an artist's rendition of the Deep Impact flyby spacecraft releasing its impactor, 24 hours before the impact event in July 2005. Pictured from left to right are comet Tempel 1, the impactor, and the flyby spacecraft. The impactor is a 370-kilogram mass with an onboard guidance system. The flyby spacecraft includes a solar panel (right), a high-gain antenna (top), a debris shield (left, background), and science instruments for high and medium resolution imaging, infrared spectroscopy, and optical navigation (yellow box and cylinder, lower left). The fly spacecraft is about 3.2 meters long, 1.7 meters wide, and 2.3 meters high. The launch payload has a mass of 1020 kilograms. A recycled NASA spacecraft that has already bombed one cometis headed for another one, after a slight detour by Earth that required atricky engine maneuver to put it on track for both flybys. 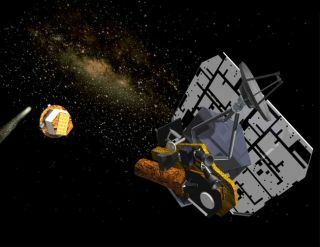 The Epoxispacecraft, which was originally built as the mother ship for NASA's DeepImpact mission mother ship, fired its engines on May 28 for 11.3 seconds tofine-tune its planned June 27 flyby past the Earth and trip to visit the cometHartley 2 in November. "While it was a small burn, it was a big step ingetting us to Hartley 2," said Tim Larson, Epoxi project manager at NASA'sJet Propulsion Laboratory (JPL) in Pasadena, Calif. "Humanity's fifthclose-up viewof a comet is less than five months away." The maneuver sets the stage for a planned Nov. 4 swing bythe comet Hartley 2, though Epoxi will just observe that icy wanderer and not letloose an impactor probe to crash into it like the original Deep Impact missiondid to the comet Tempel 1 in 2005. Epoxi's recent engine burn changed the spacecraft's velocityby a mere 0.1 meters per second (less than a quarter mile per hour). But thatwas all the mission navigators needed to take advantage of Earth's gravity to geta speed boost for Epoxi's trip to Hartley 2. Epoxi is an extended, unmanned mission of the DeepImpact space probe. Its name is derived from its dual scienceinvestigations ? the Deep Impact Extended Investigations (DIXI) and theExtrasolar Planet Observation and Characterization (EPOCh). The spacecraft was built for NASA by Ball Aerospace &Technologies Corp., located in Boulder Colo. JPL manages Epoxi for NASA'sScience Mission Directorate in Washington, D.C. The University of Maryland isthe Principal Investigator institution.